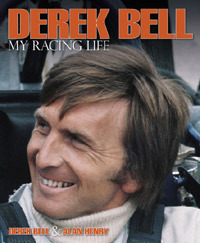 Book Review: Derek Bell My Racing Life (Haynes). Homepage. This page: Derek Bell - My Racing Life. Published August 2011. (Hardback, 272 pages). Peruse the television guides and, on terrestrial TV at least, you'd be forgiven for thinking that motor racing was all about single seaters, Formula 1 in particular. Dig a little deeper into the subject though and there is a wealth of motorsport activity taking place every weekend, both in the UK and overseas, that rarely gets a look-in on mainstream TV. As such, many of the big names even in sports such as rallying, which at one time was a regular feature of BBC2 and later Channel 4 schedules, are rarely known to all but the afficionados. Derek Bell is a name that has been associated with motor racing since the 1960s, yet despite this is not - for most - a household name. Anyone with an inkling of an interest in the sport though will first and foremost associate his name with epic drives in sportscar endurance events, his five Le Mans victories being the highlights of his long, and very varied, career. The first edition of this book was published in 1988, this latest 2011 publication repeats much of what appeared in the earlier book, adding in the many different on- and off-track activities that have occupied Mr Bell in the years since the late 1980s. Once again, the book of his racing life was co-written by long-term friend Alan Henry, a seasoned motorsport journalist. His professional racing life begins with Formula 3 events in the 1960s, followed by Formula 2 in a Brabham BT23C. As was common in those days, Derek didn't restrict his racing exploits to just one Formula, he'd also be found competing in the Tasman series and also behind the wheel of various sportscars, honing his craft and ensuring that his name remained on the radar of Formula 1 team owners as he looked to graduate up the motor racing ladder. Climbing this ladder wasn't always straightforward at a time when many other talented drivers were available, and the book recounts the behind-the-scenes ups and downs of a racing driver's existence, where often they'd enter seemingly-unimportant races, just to keep themselves active and, importantly, in front of both the public and team managers alike. As the 1970s unfolded, his sportscar racing career really took off, and thoughts of a life behind the wheel of a Formula 1 car were shelved despite initial promise shown when racing for Ferrari, Surtees, Mclaren and Tecno in the early years of the decade. Cars such as the mighty Porsche 917 would provide a home for the talented Englishman, and his races for the German team are clearly documented, as are his relationships with contemporary drivers. Versatility was still very much in evidence during the 1970s. In addition to Formula 1 and sportscar drives, Derek also competed in touring car events piloting such machines as the BMW CSL (a great car), and the Broadspeed XJ12 (what should have been a great car). Porsche though would be the manufacturer with which he was most often associated during the 70s, 80s and 90s, having driven most of their sports cars, from the all-out track cars such as the 917, 956 and 962, to cars that, in silhouette at least, reminded the fans of road-going cars, such as the turbocharged and very wayward 934, the 924 Carrera GT, and the 935. The book then goes on to cover his life in the years following the publication of his first memoirs, which began with a move to the United States and competing in sportscar events there. By the year 2000, at 59, most people would be thinking about slowing down a little, yet a phone call from a contact at Bentley Motors saw him take on a development role for Bentley's new Le Mans car, and also their new road car, the Continental GT. His dealings with the German-owned firm populate the later pages in this book, a relationship that would go on to see him open a Bentley dealership in the USA. So while he has hung up his professional racing driver's gloves, that isn't to say he isn't occasionally to be found behind the wheel of a historic car, as witnessed by visitors to various Goodwood meetings in recent years, and the occasional road rally for classic cars. Whether he still competes in lawn mower racing, a photo of which appears on page 249, and something he enjoyed hugely, I'm not so sure. Although I wouldn't class myself as a huge follower of sportscar racing in recent times, I found this book about a driver who started out in the 1960s, battled his way through different genres of racing until achieving major success in a wide variety of cars and events, a very enjoyable read.